The Red River Zoo is excited to announce our female Bactrian Camel, born June 30th, is healthy and on exhibit! Although the calf was born healthy, zoo staff became concerned after observing that she was not nursing. Even when prompted and pushed to the “right spot” she was just not figuring it out. If too many days went by without immunoglobulins from mother’s milk, the calf would be at high risk for infections and disease.Animal care staff went into action! They were able to milk the mother camel and bottle feed the baby while continuing to help encourage the calf to nurse properly. 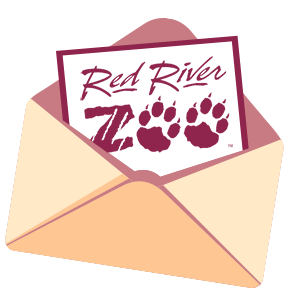 Red River Zoo conferred with experts at Minnesota Zoo and met Red River Zoo staff half way between Fargo and Minneapolis to deliver camel plasma. This delivery would boots the calf’s immune system and give the little camel the best chance for a healthy outcome. Zookeeper’s passion and dedication to animal care has paid off. The little camel calf is healthy, energetic and nursing on her own! Guests can see the new camel and vote for her name during regular zoo hours, from 10am until 7pm daily. Chili’s serves up delicious food AND support for the Red River Zoo!